Now, before I show you any photos of the "final" room, I would just like to explain a few things. 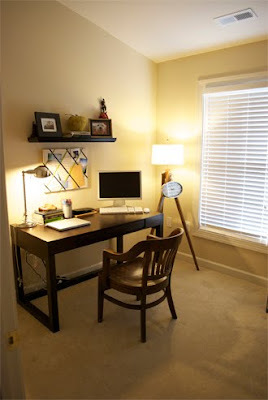 When my husband and I decided to re-do the home office/2nd guest room, we knew we wanted it to be a fully functioning home office since we both work from home several days a week. I was a bit hesitant to remove the guest room part of the room since we would lose out on extra sleeping quarters for our friends & family. 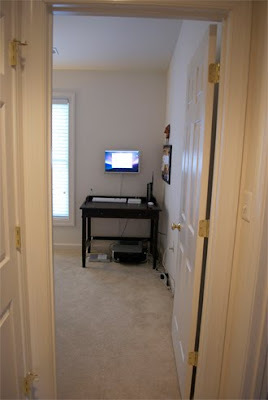 Well, after several discussions of the pros and cons, we obviously (because you know that we've been working on this) decided to stick with a full home office instead of a quasi home office. There were a few key pieces that we knew we wanted/needed. A desk being one of them and another being a lateral filing cabinet. We had both items but they just weren't cutting it so we knew we had to upgrade. After weeks and weeks of searching on Craigslist I came across one of the best finds of my entire Craigslist-searching life. A brand new $70 solid wood desk! And in the same silhouette as what I was looking for. I also scored a lateral filing cabinet for $35. If you didn't already know, filing cabinets are insanely expensive at retail stores. I refused to pay the $350 price tag that went along with the lateral filing cabinet that we were eyeing at Office Depot. 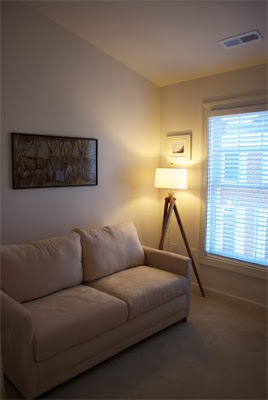 $350 could get me a new rug, or a chair to go in the tv room. 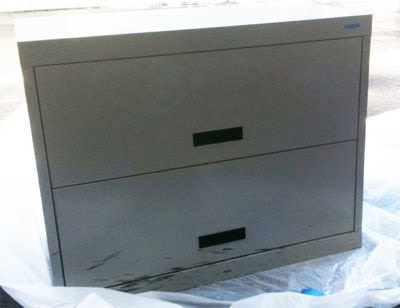 Anyways, I knew that I was going to spray paint the filing cabinet wherever we got it from, so it didn't matter to me if the $35 Craigslist find had some scuff marks in the front. The wonders of spray paint (dark blue spray paint in this case). 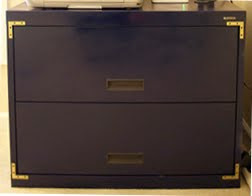 Oh, I forgot to mention that I superglued L-shaped brass brackets to the corners of the drawers to add just the tiniest bit of drama to it so that it wouldn't be just any old filing cabinet anymore. Okay, let's get to the good part! I can see how the office part of the room looks like a complete after-thought. Ugh, the walls are so blah. So messy having the printer underneath the desk. Tsk tsk to us. Ah, the filing cabinet looks right at home. 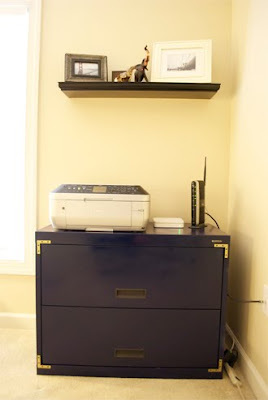 No more printers on the floor! A fresh coat of paint really added some warmth to the room. I still can't believe that the desk was only $70. What a find. See that french board in the after photos? We made that! It was so easy. All you need is a canvas board that you can find at Michael's or any other art supply store. We got ours from Michael's for $9.99. 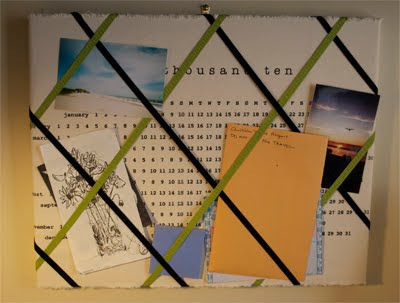 Then just pick up some ribbon too (also from Michael's) and some thumbtacks and tack on the ribbon on the diagonal and criss-cross them over the board. 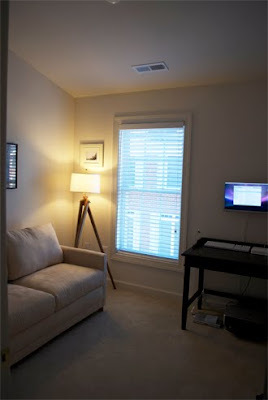 There are still a few things that I would like to add to the home office (i.e. a comfy chair, an accent rug, a new desk chair, and one more wall shelf), but I wanted to share with you all how much progress we made this past weekend. I'll share more once we get it all done. It looks fabulous! 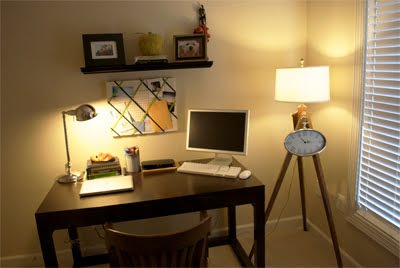 A room like that makes me want to be productive. Bravo! Thank you! That's what I'm hoping for!